RV Utilities sure help make RV'ing easier! Today's RV's themselves are built better with improved water tanks, better filters and more and more parks with everything to make life easier. Also, RV Hookups are usually better and easier today than they were 10 years ago. Before we get into hooking up your RV - let's understand how this all comes together "under one roof". There is a separate page listed here for the Plumbing System and further below for the Propane System as well as the Electric System of a generic/typical RV. Unless you have a firm grasp of the differences, we strongly recommend reading these pages as well. Water is an essential for all humans. It must be properly handled and preserved or serious illness can result. Years ago, the water storage tanks were steel and had to be flushed and maintained regularly. Today's water tanks are a special plastic that don't need much to keep them clean. The most serious part of "water" is the source and filtration used. The source should always come from an outlet that is for drinking water - only! NEVER use the hose or outlet next to the dump station. It will "appear" to be fine. The previous "dumper" probably used that outlet for washing out their dirty sewer hose. Your stomach will confirm it within 24 hours!! Look around - there will usually be a hose away from the dump area to use for drinking water! A very important tool to have, as part of your water inlet/refill system, would be a water pressure regulator. We like this one because it shows the incoming pressure from the park source and allows it to be adjusted. RV Plumbing is designed to handle up to about 45 - 55 lbs pressure MAXIMUM. Now, remember that your RV is a rolling earthquake. Guess what happens to plumbing fittings - they get bounced around as you cruise down the highways! All you need is too much water pressure while filling your tanks, or while just parked in an RV Park that happens to have very high well or city water pressure. That extra pressure from the city water supply must be regulated to not go past 55 lbs pressure. Be sure to always use a good pressure regulator to help control the water flow into your tank or various plumbing fixtures within your RV. Cheaper ones are readily available, also. 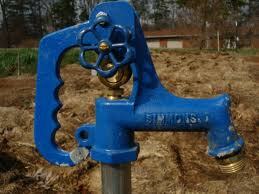 Shurflo is the "typical" 12 VDC water pump that pumps water from your holding tank to your faucets! It is usually well hidden within the bottom of your storage area - usually near the water tanks and hot water heater. Not easy to get to or change, but not difficult either. If you find your water pump getting louder and louder - change it while it still works! Otherwise, Murphy will make the decision for you on a cold, windy and rainy day when you really don't want to do it yourself!! It only has 2 fittings - inlet and outlet to plastic pipes and 2 or 3 electric wires - very basic really - just need to be able to work in small spaces!!! Remember this page - RV Utilities - you may need it someday!! Filter(s) for your water should be used as well. We recommend the larger type RV water filters for ALL the water coming into your tanks. Then, use smaller particulate filter(s) for your actual drinking water. Remember, humans need clean drinking water above all else. Some inside water filtration systems are expensive - no denying it! Now, your "home" is set up to do real cleansing for your drinking water from the kitchen. The rest of the faucets are sinks and showers with the basic filter only. Is it worth the investment? We think so; considering, we never "really know" where our drinking water comes from while traveling! 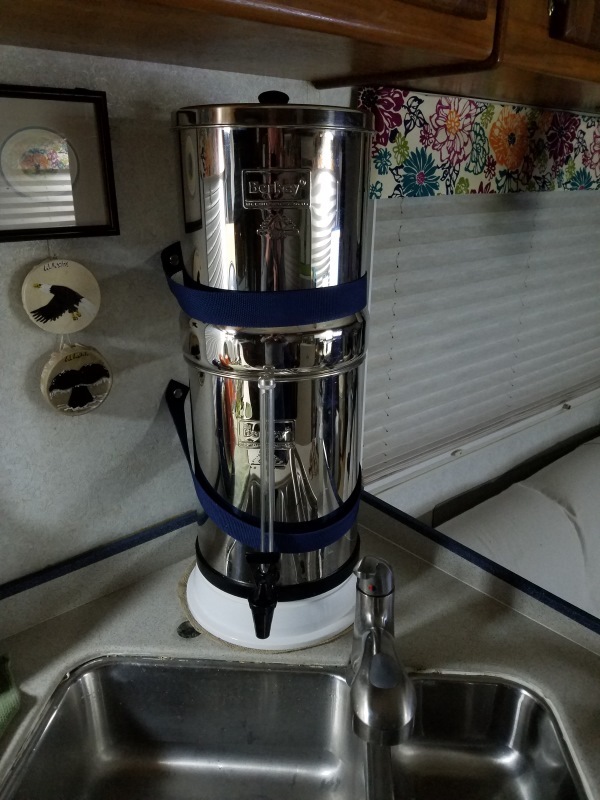 Take a look at our RV Water Filters page for a great water purifying system - tastes great and minimal care needed with it! Hoses for putting your water into your RV are just as important. Obviously, the hose and end junctions need to stay clean. It should also be a "drinking water" hose - typically white - not just the hose from your garden or garage - remember how important it is! Depending on the style or type of your RV utilities, will dictate how much water you can store. Since we boondock a lot, we always keep our tanks full. If you are going from park to park, it won't be necessary. But, things happen and you'd feel really silly in a long traffic jam with no water - always carry a minimum, at least! If the temperature outside is a concern, there are great already made insulated hose! These are 2 different storage tanks within the RV "sub-floor" for these tanks. Each with it's own separate "waste valve" to allow the dumping of these tanks. These RV Utilities sure make traveling easier! Black Dump Tanks are designed to store only your waste from the RV Toilet(s). Some older RV's may mix, but not very common. The RV toilet will have a special system for flushing itself directly into the black tank. The black tank is vented also. Gray Dump Tanks are the catchall for all the sinks, showers and washing machine. The plumbing system is similar to a house in that it will have "p-traps" and vents for each trap and then one common roof vent for the tank itself. The vents within the RV can be a problem - Discussed further down. The gray tanks will have kitchen food residue in it so should never be "dumped" on the ground - it will attract animals! 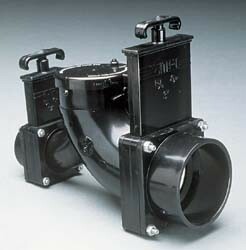 The 2 "waste valves" of the Black and Gray Tanks will meet in a special fitting similar to the picture here. It will allow one common hose to drain both tanks. Drain Procedure - Always verify the hoses are all hooked up to the RV and the Dump site. Then, it is best to open the Gray Dump Valve, and let a little flow out to be sure all connections are good - much easier to clean that up!! Then, once you are satisfied all connections are good, drain the actual Black Tank FIRST. Since your tanks will drain better when closer to full, you will want your tanks pretty full when you drain. Since the gray water valve is opened last, it will then help "clean" your RV sewer hose of the black tank residue inside the hose. Sure makes it easier to handle the hose for storage! Even if parked in a RV Park with your drain hose hooked up, do NOT leave your gray or black dump valve open. The tanks need to be near full to properly drain and clean the tanks while dumping. If you leave the gray open all the time, the tank will never "self-clean". Worse, it will get real stinky around your RV every time someone dumps their tanks - that air pressure created underground will push the fumes out at your site - yech! The worst - "critters" could crawl up into your holding tank from the underground sewer system - double yech!! And you thought all this RV Utilities stuff was simple! Just kidding, it really is! Great Video About Dumping Tanks! If you've ever had a waste valve stick open, or break in the open position - you can already sense the panic!! Well, here is a great fix! 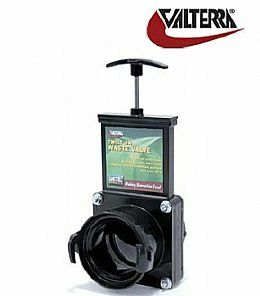 If you still have the "bayonet" style connectors for your waste hose, Valterra came up with a great temporary or permanent fix for you! The Polychute System or The Drain Master System. Both are shown above. 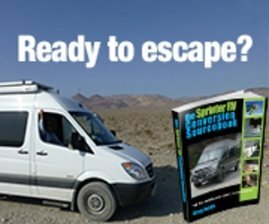 They are identical systems except for how they attach to your RV. 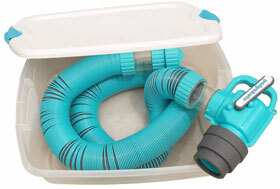 The Polychute system (upper left)uses a special collar that connects to a typical RV "Bayonet" drain hose fixture on the RV. The Drain Master system (upper right) uses an industrial "Cam Lock" connector to your RV. The Hose, fittings, elbow and shut off valve are the most superior system out there - believe us - we've tried them all!! Either system will work flawlessly for you and protect our earth from sewer leaks! 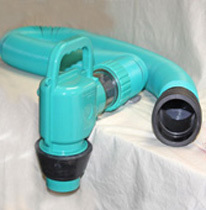 Once you have the Polychute or Drain Master System, you'll never change to the typical hose/couplings again! 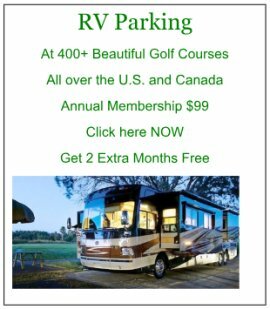 Finally, a real solution to all the clumsy methods we RV'ers use to get our drain hose to the dump hole when we are parked in a RV Park. As Flow Down says - "The Wait is Over"
Macerator Pumps are similar to a garbage disposal system. It is a smaller version of that attached to your drain/waste valves to "liquefy" your waste before it goes into the ground disposal system. Many users love them. We had one for about a year. After a while, we noticed a sewer odor getting stronger and always present. Since the waste valves were getting "sticky", we decided to change them before one of the handles broke off - a definite oops!!!! Upon removal of the waste valves we noticed a tremendous build-up of "muck" in the entire elbow/valve areas. Thinking through the operation of a macerator pump vs a 3" drain hose, we immediately went back to the 3" drain hose - and purchased our Drain Master System! We quickly understood what was happening! The solid/heavier waste was flowing out of the tanks too slowly with the macerator pump. Typically liquid would flow, but heavier waste didn't have the suction of a 3" outflow to help draw solids out of the tank into the macerator pump. As a result, "muck" was slowly building up in the elbows/valves and I'm sure the tanks themselves. With a 3" outlet once again available, the wastes flow out completely, quickly and thoroughly - voila - no odors since!!!! Please review the RV Utilities and Propane page as well. Propane is the most common utility for cooking, heating your hot water tank, powering the hot forced-air furnace and yes, even cooling your refrigerator! The Class A, B and C's will have a permanently mounted tank within the coach. Permanent tanks can be closed off and then driven through highway tunnels. The portable tanks on campers, 5th wheels (Non-Motorized Vehicles) prohibit that. Some of the higher-end coaches will have a hot water system for heating the coach and hot water - powered by a diesel system. They may have a propane stove. Today's very expensive Class A Diesels may not have propane at all! Then, everything is powered by electric - it will have a house type refrigerator and electric stove - no propane needed! However, you better plan on being in a RV Park 24/7/365 or listen to your generator a lot!! Suddenly RV Utilities becomes a very important research item!! How many times have you seen someone plugging in their RV with the 30 or 50 amp circuit breaker on and in the RAIN?? Big time Oops!! 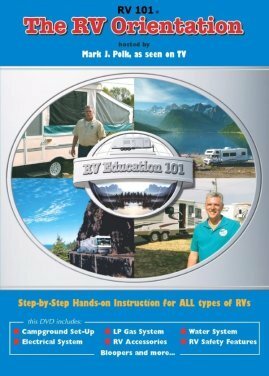 Please visit our RV ELECTRICITY BASIC PAGE for a detailed explanation and diagram of your RV Electric Systems, as part of your RV Utilities understanding. Electricity really is a great addition to our RV Utilities. As our RV's become more complex - and they sure have recently - electricity is becoming more important - and, we more dependent on it in our RV Parks. As the RV becomes more demanding of electricity, the RV Parks are upgrading to provide more sites with 50 amp service - instead of the standard for years - 30 amps! Between 2-3 roof A/C units, dryers, dishwashers (yes- dishwashers!) giant TV's, computers, etc. etc. - RV'ers are gobbling up electricity! Solar has become very popular with those RV'ers that want to stay "off the grid" and enjoy life in the outdoors. It's a great alternative to a noisy generator or neighbor in a park! Hooking up to "shore power" within a RV Park requires a special cable that connects the coach to the electric outlet in the park. They can be pretty expensive, but a good cable will last years. Be sure to have an extension cable available as well - guaranteed that perfect level spot will be just a tad short of the utility post for connecting to shore power! Don't forget our RV Appliances and Solar pages, lots of great info as well. RV Utilities are easy to understand, once you've tried the various systems and hookups - don't be nervous, we've all been there!